This is the second in a three-article series on labor conditions in Bangladesh by Larry Luxner, a freelance journalist based in the Washington, D.C., area. Luxner spent 11 days in Bangladesh earlier this year as a guest of the country’s Ministry of Foreign Affairs. To read the entire series click here. CHITTAGONG, Bangladesh — Mention “sweatshops” and Bangladesh in the same sentence, and images of hundreds of subservient, hard-working women hunched over sewing machines on a gloomy factory floor are likely to come to mind. It wouldn’t be far from the truth. At the Chittagong Export Processing Zone — one of the world’s largest industrial parks — some 150,000 Bangladeshis, most of them women, assemble everything from Tommy Hilfiger polo shirts to Reebok running shoes. They toil eight hours a day, six days a week, earning only $37 a month on average. That makes them among the most exploited factory workers on Earth. Nevertheless, these free-zone laborers have it a lot better than their counterparts in Sitakunda, a coastal village about 20 kilometers north of Chittagong. Here, in a landscape dominated by rusting pipes, broken glass, electric cables and propellers rusting by the roadside, is ground zero of the world’s shipbreaking industry. Even by Bangladeshi standards, this place is one massive eyesore. We weren’t supposed to be here. Our 12-member international press delegation, which had been invited to Bangladesh to report on economic development and the fight against poverty, had visited the Chittagong EPZ earlier that day. A number of us, having heard that Bangladesh was a leader in shipbreaking as well as shipbuilding, pressured our government-appointed guide, Ziauddin Ahmed, to arrange a visit to one such operation. To our surprise, the request was approved. We were even given permission to photograph anything we wanted — a switch from the free zone, where our movements and ability to shoot pictures were severely restricted. As our minivan bounced along the road and entered the muddy premises of Rising Steel Ltd., we were met by three executives: Amjad Hossain Chowdhury, the company’s managing director; Hefazatur Rahman, chairman of the Mostafa Group of Industries, and Kamal Uddin, owner of Arafeen Steel. 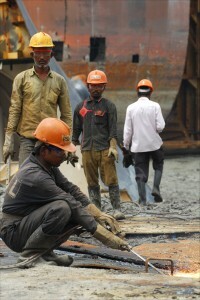 Workers in hard hats and safety goggles at Rising Steel Ltd. in Chittagong, Bangladesh — home to one of the largest shipbreaking operations in the world. The trio escorted us up the stairs to an air-conditioned conference room. Like everywhere else we went, a long table sat in the middle of the room, laid out with bouquets of flowers, cookies, sandwiches, fresh fruit and bottles of mineral water. Uddin told us it would take gangs of oxyacetylene cutters nearly six months to dismember the Lara 1. And that’s only one of more than 250 ships — mainly of European origin — brought to Sitakunda at the end of their useful lives every year to be dismantled by hand, piece by piece, by workers earning an average $1.50 a day. That’s especially true for Bangladesh, a Florida-sized country of 160 million inhabitants without any iron ore resources. Hence, the nation’s construction industry depends on dying ships for its supply of steel. In addition, the shipyards recycle other vessel components such as propellers, generators and engines for extra cash. If world steel prices rise, Rahman said his company could score a profit of $10 million. But if they go down, it could be a repeat of 2008, when Mostafa lost $20 million. 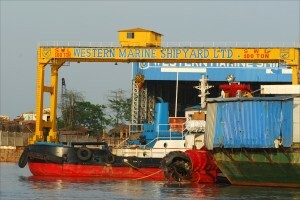 Chowdhury said his shipyard began operations in 1996, and that it produces around 200,000 tons of scrap annually. “Every employee must go through three months of training,” he said, estimating that shipbreaking employs 200,000 Bangladeshis directly and another million indirectly. The industry generates $1 billion a year for Bangladesh and provides nearly 60 percent of the country’s total steel demand. Yet Muhammed Ali Shahin doesn’t buy that at all. Since the industry started in the 1980s, says Shahin, more than 1,000 workers have died — including 15 in 2011 alone. On May 31, 2000, an explosion aboard a decommissioned Iranian oil tanker left 16 workers dead and another 50 severely hurt. The biggest causes of shipyard accidents are explosions of leftover gas and fumes in the tanks. Many workers are also electrocuted or crushed by falling beams or plates. Hulk of a rusting cargo ship at Rising Steel Ltd. in Chittagong, Bangladesh — home to one of the largest shipbreaking operations in the world. During our visit to Rising Steel Ltd., every worker we saw was wearing a yellow helmet and safety goggles. But Shahin said even that’s deceptive. It’s not as if nobody has ever complained about the shipbreaking industry before. Back in 1998, Baltimore Sun staff writers Will Englund and Gary Cohn shared a Pulitzer Prize for investigative reporting following a scathing series on the Navy and lax enforcement of labor regulations that took the journalists as far afield as India. But the situation is even worse in neighboring Bangladesh, which thanks to its rock-bottom wages now controls 50 to 60 percent of the world’s shipbreaking industry. That’s according to Rizwana Hasan, executive director of the Dhaka-based Bangladesh Environmental Lawyers Association (BELA). 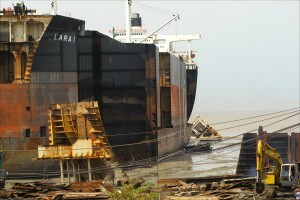 In 2009, BELA took the industry to court — and the court ruled that shipbreaking yards must comply with international law. It also found that every ship must be pre-cleaned of toxic substances before its arrival in Bangladesh. But “nobody follows that law,” Shahin complained. Metal pipes rust on the ground at Rising Steel Ltd., a shipbreaking facility just outside Chittagong. The Bengali inscription warns men not to wear their dhotis or lungi skirts while on the job in order to avoid accidents. Hasan agrees. She told us that in the three years since Bangladesh’s highest court ruled against them, 40 laborers have been killed. “The shipbreaking yards are flouting the ruling of the Supreme Court because they enjoy political blessing,” said the attorney, who in 2009 was awarded the prestigious Goldman Environmental Prize for her activism on behalf of shipyard workers.